PEARSE DOHERTY HAS said that he has no personal desire to lead Sinn Féin and would not contest the leadership if the position arose in the near future. The party’s finance spokesperson has been tipped in some quarters as a possible successor to Gerry Adams but told TheJournal.ie this week that while he would not rule out a leadership bid altogether it is not on his horizon in the near future. He cited his young family – who are based in Donegal – as one of the reasons for not pursuing the leadership and said that his current finance brief already leaves him with enough of a workload. He said he was satisfied with Gerry Adams’s leadership of the party and is confident that the Louth TD will lead Sinn Féin into the next election, as he has already stated he will. “I think we need somebody with his leadership abilities and he’s proven – as the most popular party leader [with the] result of the last opinion poll - that he’s a huge asset to the party and he brings a wealth of experience,” Doherty said. The TD – who was first elected in a by-election in 2010 – said that that he thinks it is right that his party colleague Peadar Tóibín faces punishment for voting against the party on the Protection of Life during Pregnancy Bill. Though Sinn Féin intends to support the landmark legislation when a vote is held next week, Tóibín has said he cannot support it because of the inclusion of the suicide provision. Doherty thinks that while this is “hugely regrettable”, the Meath West TD’s decision to violate the party whip deserves punishment. “The party leadership has made it clear, and I’m part of that, that anybody who breaks the party whip will be dealt with and will have to deal with the consequences,” he said, adding that Tóibín was nonetheless a “great Republican”. 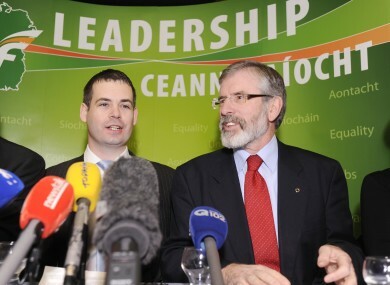 Email “Pearse Doherty: I don't have any personal desire to lead Sinn Féin ”. Feedback on “Pearse Doherty: I don't have any personal desire to lead Sinn Féin ”.